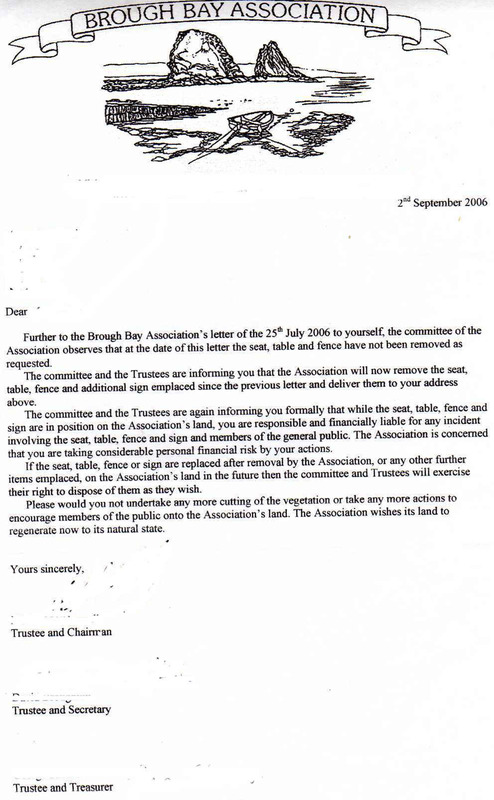 Thank you for giving us sight of the letter from the Brough Bay Association. We think the seats erected are an excellent facility both for the benefit of residents and tourists alike and hope that you will not remove them. They provide a nice spot for people to enjoy the environment and the views. We, as paid up members of the Brough Bay Assocation, were not consulted about this letter, and we are interested to know who instructed the Trustees to write to you. We certainly did not, nor were we invited to a meeting to discuss its contents. The letter is therefore unconstitutional and illegal. It is apparent that none of the Trustees are aware of the economic benefits that tourists bring to the area, as support by the North Highland Initiative which has been developed by Prince Charles, the Duke of Rothesay, himself and many local businesses. If you require any assistance from us with regard to raising a petition from the villagers, please do not hesitate to contact us.